Craftin' Caro: FREE CARDSTOCK & a very special THANK YOU! FREE CARDSTOCK & a very special THANK YOU! I want to start my day off by giving my heartfelt thanks to ALL of my wonderful customers and demonstrator team members this morning. I thank my lucky stars for all of you everyday anyhow, but today I feel especially fortunate since I'm able to announce that thanks to your help, I have earned Stampin' Up! 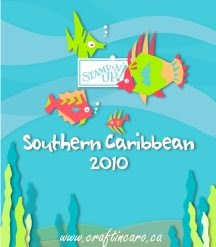 's fabulous 2010 Incentive Trip! We'll be going on a Southern Caribbean cruise on Royal Caribbean's beautiful "Adventure of the Seas" ship. Morgan and Serena are beside themselves with glee since all their hard work labeling catalogues and helping Mom stuff envelopes has really paid off - LOL! I can honestly say that I've been blessed in my business beyond all measure, and I just want to continue working even harder to help keep my stamping friends and team happy with what I can offer them. I truly welcome all ideas and feedback from you -- I want this new 2009 year to be the best one ever for us all! Anyhow, mushy stuff aside -- let's bring on the LOOT! Yes, I want to thank you all not just in words but in FREE GOODIES, and Sale-A-Bration is already such a fabulous time for me to do that. FROM NOW UNTIL THE END OF FEBRUARY -- you will receive a fabulous FREE 48 sheet assortment of ALL of Stampin' Up! 's 4 colour families: one 8.5x11" sheet of each of the Bold Brights, Rich Regals, Soft Subtles and Earth Elements for each $60 order you place with me. You heard it -- not only will you get to choose a free Sale-A-Bration set per $60 purchase, but you'll also get 48 pieces of Stampin' Up! 's delicious cardstock from me. YUM YUM! You can place your order online or by phone/email to take advantage of my special gift -- I'm just so happy to be able to help say "Thank You" in one more way! Way to go!!!!!! I am soooo glad that I could be a part of you getting there!!!!! :) Now wouldn't it be sweet if I too could join you! Not for 2010 but FOR SURE in 2011!!! You go girl!!!!!!! You must be on cloud 9!! SO happy for you!!! You deserve it! And free paper? Well, you can't beat that - heehee!